Reducer 2 Inch / 1.25 Inch. Convert your 2" focuser to use with 1.25" eyepieces. Baader have cleverly designed a clamping system to spread the grip on your eyepieces around the full width of the nose piece to prevent any damage from pressure, whilst at he same time producing a tremendous amount of grip, another feature is T-2 threads on eyepiece side for incorporating this accessory further into your T-2 arrangement, for example T-2 Extension tubes #1508154 or #1508153 for afocal projection. 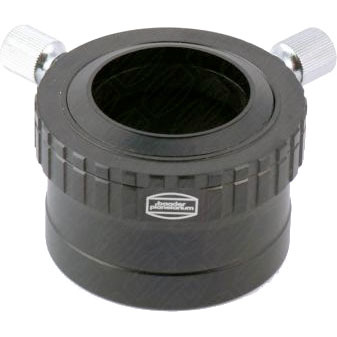 Eyepiece side has a removable ring that exposes male T-2 threads.